Brennan presents a menu that is highly personalized but always within the Picholine tradition of French technique with seasonal American ingredients, never attempting to shock the palate or confuse the senses. Twenty-three years in the rough and ever changing NYC restaurant world is not just an accomplishment, it is an occasion to put things in perspective. 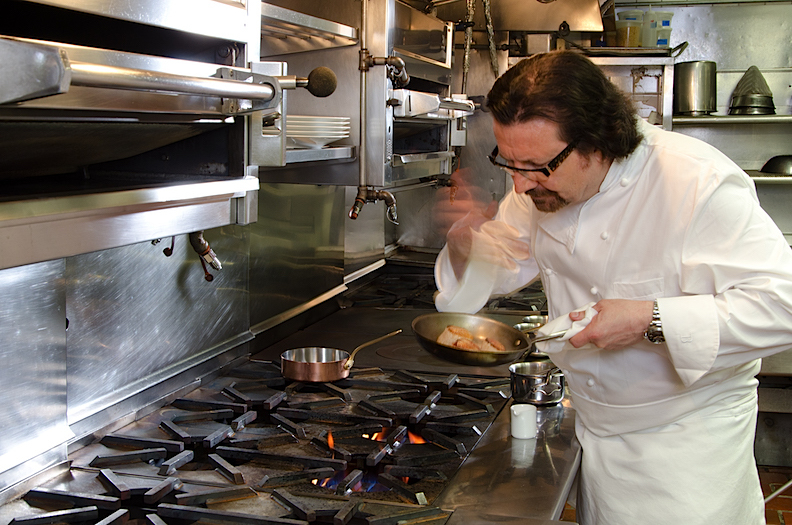 When Terrence Brennan opened Picholine on the Upper West Side, the area was not known for upscale dining, but Brennan stirred the pot, to be followed by Per Se, Jean-Georges, Asiate, A Voce, Bar Boulud, Boulud Sud, Ed's Chowder House, Dovetail, Telepan, Lincoln Ristorante and The Leopard at des Artistes, all playing host to a pre-theater/concert crowd before a more leisurely clientele arrives at eight. Thus, anyone who carps that dining at the highest level beyond Central Park South is improbable has simply not eaten there at all. But Picholine really started the ball rolling, and Brennan (above) is widely recognized as one of the city's master chefs, whose cuisine has evolved in the most subtle and elegant way, never giving in to trends but always watchful for what is truly innovative, always with a Mediterranean undertone. The wait staff is seamlessly sewn into the fabric of refinement here, without ever crossing into rote, the 600-label wine list, selected by Nikolis Rouet, is as impressive as ever, and the cheese cart, while not quite as large as it once was, is now better focused and more user- friendly. You enter Picholine (named after a French olive) from the relative quiet of West 64th Street into a bar area--called the Salon--with a cosmopolitan whiff of swank, a great place for a well-made cocktail and shortened menu after work or theater. 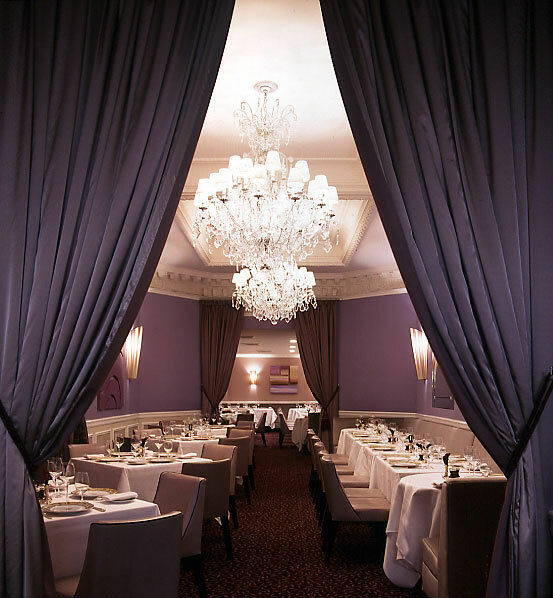 Then, past dramatic lavender velvet curtains, you enter a room with gray mohair banquettes, wine-colored patterned carpet, a grand chandelier and very comfortable chairs--all defining the best connotations of being soigné. Beyond is another, slightly more intimate dining room. Needless to say, the linens, silver and stemware follow suit. You are presented with excellent bread and butter, and soon come the amuses, which, on my recent visit, included a carrot "swizzler" made from dehydrated carrot, carrot chips, labna cheese spread and a spice mix called dukkah; a quail egg wrapped in brioche with caviar; and the engaging idea of manchego cheese tempura. The palate is indeed amused. Along with Chef de Cuisine Justin Urso, Brennan presents a menu that is highly personalized but always within the Picholine tradition of French technique with seasonal American ingredients, never attempting to shock the palate or confuse the senses. Thus, there is a panna cotta of smoked sturgeon and (salty) wild American caviar, with beets and apples. A classic Italian wild mushroom risotto mixed with pecorino acquires American sweetness from summer's corn and an enrichment of Australian black truffles. Truffles, lemon and olive oil enhance pristine, raw, translucent Long Island fluke, and the soup that evening was a refreshing turn on white gazpacho, with a red gazpacho sorbet and the spark of pimentón chicarrón. Ricotta agnolotti in an artichoke barigoule was well rendered, and the taste of bottarga roe was mild enough, but the parsley pistou was pushing the dish too far. Not so the sweet Maine lobster with a radish confit, simple sugar snap peas, and a lobster jus that, like all Brennan's reductions, shows how indelible was his culinary education at restaurants like Le Cirque in NYC (which he once called "Haute Cuisine boot camp") and Le Moulin de Mougins on the French Riviera. Mid-meal fresh napkins are brought and a lovely objet d'art is placed on the table. The delicacy of halibut "en crôute" with peas à la française (a condiment made of pea and onion confit, lettuce and rhubarb) and mint showed exceptional balance of flavors that could too easily overwhelm the others, just as in a dish of spotted skate wing, the spicy chorizo emulsion and Basquaise marmalade or peppers, onions, fennel and spices buoyed the flavor of the fish, and the paella's crispy socarrat of rice gave it another dimension. Upon seeing "Four Story Hill suckling pig" on the menu, I feared Brennan might follow the French tradition of packing the pig into a roulade to no advantage, except to dry it out; instead it was a juicy piece of slowly cooked fatted pork with a thin sheet of crackling skin, with the flavors of a tangy, cured torpedo onion, sour-sweet peach mostardo and pickled mustard seeds. 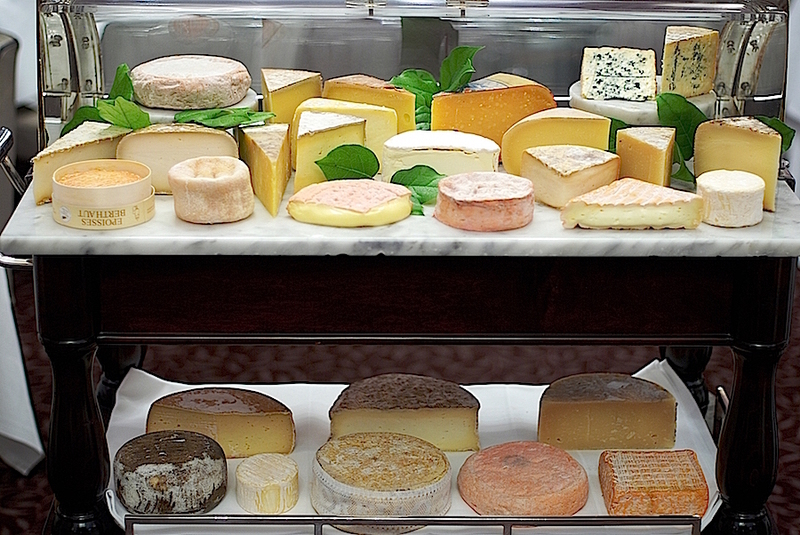 With a meal of these dimensions, it's difficult to save room for both cheese and dessert, but we were helpless in resisting when the cart with two dozen cheeses, amply described by Steve Lally, rolled to our table. Key to serving cheeses so that the guests' appetites don't flag is to cut and plate them quickly, which they do at Picholine with aplomb. Desserts, by Matthew O'Haver, included a lovely, deeply flavored dark chocolate crèmeux, milk chocolate espuma and white chocolate semifreddo, and a lemon and olive tart with candied fennel, olive oil sorbet and basil, which pretty much sum up the consistent style of Picholine from start to finish. Of course, sorbets, ice creams, petits fours and chocolates ended off this grand feast While my wife and I finished our wine, I glanced to the vacated next table, where a busboy was replacing the tablecloth with a care and attention to detail--folds, creases, equal lengths--that showed how exquisitely well something so seemingly mundane can be, which is the mark of a great restaurant. 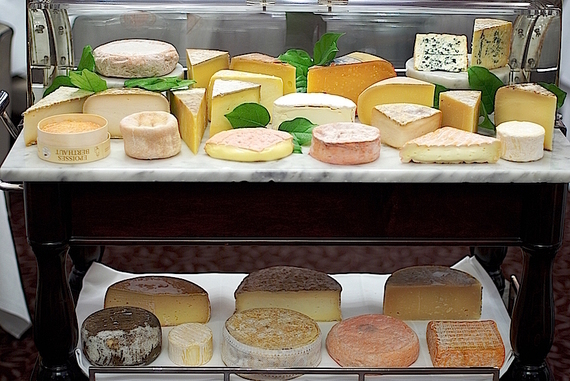 A few weeks ago I wrote of dining in Paris at L'Épicure, whose extraordinary food and service--including a cheese cart--I did not expect to find repeated very soon in my travels. But dining at Picholine was of that same level of excellence and professionalism on every count. 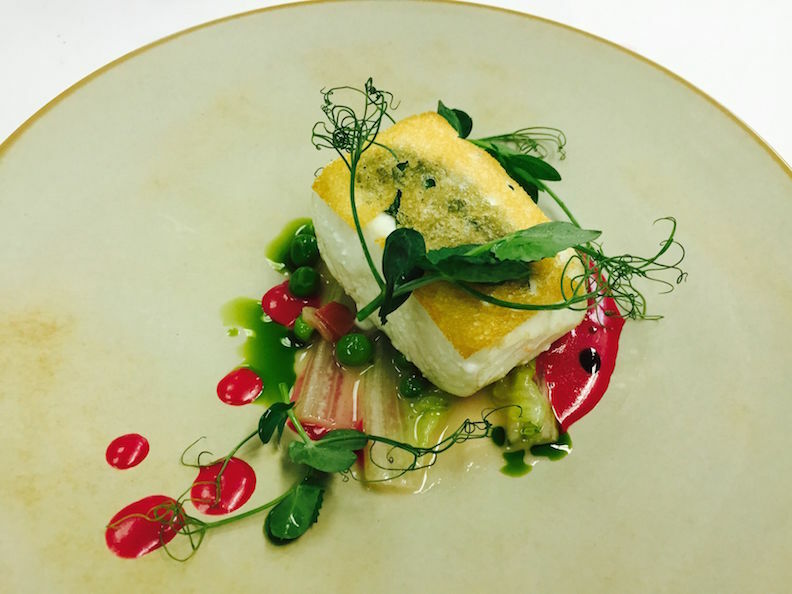 What Picholine began twenty-two years ago has only been improved upon to serve as an inspiration to other chefs and restaurateurs who dare not dream so high on their own. Picholine is open for dinner Tues.-Sat. ; fixed price 3- course dinner $105 (a la carte and vegetarian menus also available); pre-theater $88; 10-course tasting menu $195; wine pairing $125.